Contributed by Chris Taylor Jr. This kit comes with 2 rockets. 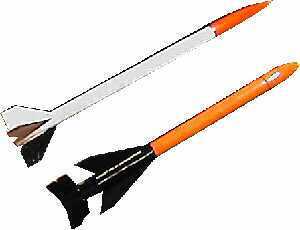 The rockets are very small mini engine rockets that are very cute to fly and display (would look great on an office desk). Very common scale kit for competition. Very simple construction. Main parts are balsa nose cone, 4 fins, and a body tube. I finished mine like the package white with red nose and one black fin. I filled the nose cone for a nice finish and the fins were fiber so they finished nicely as well. I flew it on an A10-3T, which was a bad idea. It flies like a Mosquito, now you see it now you don't. Luckily, I saw the streamer and recovered it safely. A not so common scale kit but very good looking. The fin design and arrangement is quite awesome. Again, fiber fins and balsa nose cone with two washers for nose weight. I smartened up on this one and flew it on a 1/2A motor for very impressive flight. At least I got to watch this one. I filled the nose cone and painted the kit to match the package, orange front half, black rear half and I added the 2 included decals. I like this rocket's design so much, I plan to upscale it into my level 1 certification project.